Not many architectural finishes beat polished stainless steel. The color is rich and can work in many design styles. 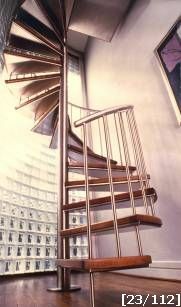 For more than 40 years, Stairways, Inc. has produced many types and sizes of stainless steel spiral stairs. Stainless steel spiral staircases easily work in contemporary settings. As shown, this stair, using a round handrail and balusters with oak steps, works with the surroundings. All stainless steel spiral stairs are made to order. Notice the recessed oak steps that add to this sleek design. The finish on this spiral stair is a #4 brushed, similar to a finish on current stainless steel kitchen appliances. These spiral stairs are for those who know what they want.